"We say that the purpose of life is glorifying God, but what does that mean? ...it means companionship"
Suffering is a reality of life. Paul, who lost the churches in Asia and many of his friends, found himself in a jail cell with only the support of a few, like Timothy. Or consider Epaphroditus who nearly died. Paul didn't respond by preaching a prosperity gospel. (Phillipians 2:27) No, he expressed great relief by saying I'm glad he didn't die or I would have been very sad. Or even consider Paul's thorn in the flesh, which most believe to be an eye impairment, which kept him humble. The enemy continually came at Paul over this imperfection. We can identify with this. We've laid our hands on friends and extended family members, felt and seen His power, had visions, dreams, even prayed numerous healings, including one family member whose story was medically documented and told across the nation; And we have watched many hearts turn to Jesus. But within our immediate family we have our own holes; Real weaknesses and vunerabilities. And the holes are gifts. A dear friend of mine has the very same experience. When it comes to others, he can easily connect with God. But when it comes to his own personal and family needs, there are times he has to rely much on others' prayers. And God has met those needs time and time again. Can you relate? We can. We need each other. Consider William Seymour, who was blind in one eye, yet he prayed down Heaven during the Azusa Street Revival or the martyrdom of Sir Thomas More, who refused to speak ill of authority while being caught between a corrupt Pope and corrupt King. How about Jonathon Edwards, who God used to start the First Great Awakening. His church rewarded him by kicking him out months later. Elizabeth Elliott saw her true love killed. Dietrich Bonhoeffer was executed four days before freedom came to Germany. Corrie Ten Boom lost her family to Nazi death camps. A praying President John Adams loved his son, but lost him to suicide and then suffered real rejection by a country who owed its very existence to him more than any man in history, including Thomas Jefferson and George Washington; Both of whom would not have been who they were without Adams. Yet Adams was beaten and humiliated in the following election by his so-called friend, Thomas Jefferson, whom he continued to love and forgive the whole way through. This is not to say that the enemy cannot be fended off via corporate prayer. The more praying taking place, the more able we are to withstand the strategies of Satan during seasons of strength; But we wrestle in this life continually with the enemy until his legal defeat is permanently administered by the One who broke his power over our souls. His power over this world still remains. So death (and suffering) comes to us all. And the greatest suffering comes to the soul; Especially when someone who finds their way inside is no longer there for whatever reason; Albeit division or death. We used to teach a church college and career class in the mid 90s. That class was centered on God's purpose: Companionship. The class (many of whom are now lifelong friends) learned that with God's presence, people have a choice to either fellowship (heart to heart) or in rejecting Him, settle to merely socialize (facade to facade). Most people talk at each other, not with each other. I used to say that you don't have to look any farther than your own dog to see the purpose of God: Companionship. We say that the purpose of life is glorifying God, but what does that mean? I submit it means companionship. What we do should be an extension and response to a Companion, which is why so many miss the point by doing great things in God's name, yet do not know Him intimately. The ministry of the Holy Spirit creates and flows out of this fellowship. The lost are lonely. And there is a hierchy and structure for companionship, starting with God. That order protects companionship. Worship is that form of companionship where we love on Him in response to His great love for us. He has made Himself vunerable to us, which is why David said "I will have compassion on You O Lord, my strength." (Psalm 18:1 - Literal Hebrew) And the purpose of companionship filters down to every aspect of life; Including pets. Nearly seventeen years ago Barnaby came into our lives. The last four years we've taken care of our pug because he was incontinent. His body was giving out but his spirit was still with us. He was blind, immobile and in constant need of bathing, yet very content because he was loved. He responded well to touch, which he received constantly. Barnaby lived on love. This bond was greater, obviously because we have had no children; Another heart ache in itself. But whatever the reasons, this has been our path with its own set of curses and blessings. Our baby was a pug; A joyful pug. After losing three grandparents within the last year, this latest loss was really felt. The sounds coming from mine and Lisa's hearts were deep. You know the deal: Weeping, embracing, even drooling (lol) and being taken back by just how rooted such a gift had gotten into our souls. We are certainly in Barn's soul. Dr. Jackie Perkins, pastor of Dayspring Baptist in Augusta, once said to me: "Some say dogs don't have souls. Well, a soul is composed of a mind, will and emotions. I can tell you that my dog has all three." C.S. Lewis believed that although Scripture is specifically silent on the issue of whether or not pets go to heaven, he did decide by Biblical principle, that the reality is implied. He believed that a pet found his or her way into eternity through attachment to a redeemed soul. We agree with that reasoning. Call it the Eternal Dog Doctrine:-) Another support is the Ontalogical Argument, which reasons that God would not bring such a wonderful friend into our hearts, only to tear him away and the friendship end. If God cares for the sparrow, you know He cares even more for dogs! God is about eternity. Our fall made things temporal; A fall He has redeemed. And eye hath not seen or ear heard what He has prepared for us. And God does above all we can imagine or ask and since Barnaby is in our imagination, we trust the reunion will be quite an experience. Barnaby is in the mix of infinity. God gave us Barnaby. This was the most laid back, affectionate and kool Pug. For 12 years he slept at the foot of our bed. We got him two months after we were married and he lived nearly to be 17 years old. One fixed memory of him was when the neighbors' big lab was growling and barking at "Barn" through the fence as Barnaby was just staring back at him, only inches away with a puzzled look that asked "Where is all this aggression coming from?" 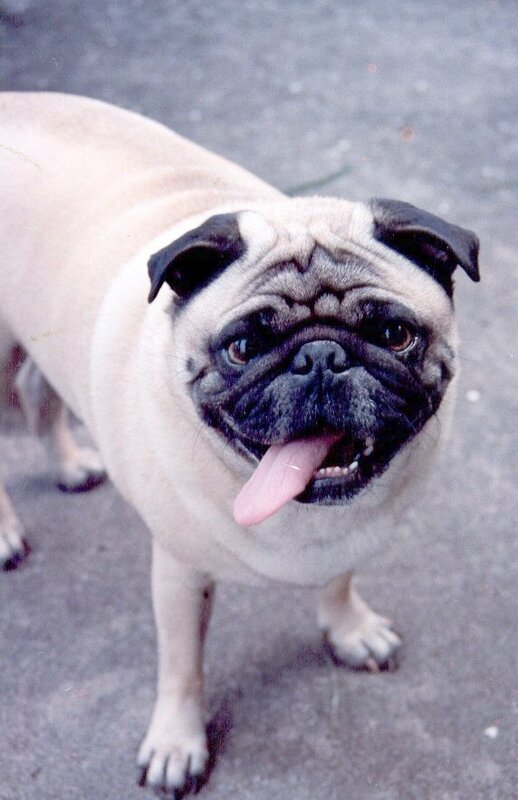 The pug who went by many nick-names, Sweet Angel Baby Sonshine, the Sweetest Thing on Earth, Snuggle Cub, Baby B, "Bee" and Barn, long ago took residence in these eternal hearts which belong to the eternal King. Whether we get an apartment or stately mansion, a certain pug is waiting for us there. Jesus is the Logos of God and the word logic is derived from logos. That dogs go to heaven is logical! Do all dogs go to heaven? Well, that is another debate altogether. But Barnaby is in heaven. He is alive. I don't just believe it. And there is comfort to letting Barnaby go into the hands of One who loves him most. The religious, Darwinized and hard-hearted may mock and make light of such a thing, but I tell you Barnaby touches God's Heart. God is Love. He knows all about this hurting feeling being felt and it matters. And one day we look forward to a reunion of friends, family members and Barnaby. There will be a green field and a pug filled with life. We will pick him up again and hold him to start a new adventure together; All this and much more because a Humble Heart who hung on a Cross for us; Who Himself died of a violently broken heart. The Lord is good; Eternally better than we deserve. See you soon Barnaby. Our hearts ache for you; Deeply...so deeply. Heaven looks better and better with each passing day.